Pets in Dubai - information about owning cats, dogs, goldfish, and other animals in Abu Dhabi, Dubai, and the UAE. List of vets, veterinary clinics, animal hospitals, emergency numbers, dog kennels and catteries for holiday trips, and contact information for K9 Friends and Feline Friends. Parks and places to walk dogs in Dubai. Many residents obtain a pet here in Dubai, or bring one with them from their home if they are foreigners. The transient nature of the population does mean that fewer expats have pets than in their home country, but as resident foreigners stay longer in Dubai and the UAE, the appeal of having a pet increases. Keep in mind that summer temperatures are extremely hot in the UAE so your favorite animal will be inside your house for the best part of 3 or 4 months, at least during the day. If moving here from another country, bringing a pet with you is possible but there are a few procedures to follow. Similarly when leaving the UAE. Depending on the type of animal you want to bring, where you come from or where you're going, you'll need to consider one or more of the following, and check one of the veterinary clinic websites below for up to date information. Local newspapers sometimes list animals, with descriptions and photos, looking for a home. Information comes from AP, Feline Friends, K9 Friends. Try 7 Days and/or the Gulf News Tabloid section. Being run over, either by strangers, or by their owners who don't wake them up while sleeping on a tyre or under the hood of the car. Getting ill after being fed human medicine. Animal systems are different from humans and from each other, don't give cat medicine to dogs etc. Being abandoned during holidays when owners go travelling. It's a really horrible way to kill your pet. Drowning, cooking, drying or washing. Pets don't read too well and are not always familiar with the operation of most home appliances. Washing machines, dishwashers, dryers, ovens, and even swimming pools are traps, especially for cats looking for a warm place to sleep. AP is an organisation that takes in abandoned pets and tries to find them new homes. It's not a pet hotel. Tel +971-50-6258375 or +971-4-3483799 if you're looking for a pet and ready to take care of one of their strays. Usually cats and dogs, sometimes birds. Financial assistance is always welcomed of course. Email abandoned-pets@hotmail.com and abandonedpets@hotmail.com (both versions seen, unknown which is correct). Cats are relatively self-sufficient, cheap to maintain and Feline Friends have plenty looking for a good home. Cats still need some degree of looking after and will not survive a Dubai summer on their own if you leave them in the garden while jetting off to some exotic holiday destination. Don't get one in the first place if you're planning that kind of abuse. Feline Friends is a non-profit volunteer organisation that looks after cats, even the ones that aren't cute any more. The volunteers put stray cats in foster homes, feed them, get the sick ones well, and really appreciate any help that cat lovers can give them. Feline Friends is not a cattery or cat hotel (there's a list of them further down on this page). However, they do get overwhelmed with abandoned cats every summer as owners go on holiday. Apparently, dogs are a man's best friend. Women like them too. You'll see plenty of dogs dragging their owners around Jumeirah near the beach early in the morning. If you want to pick a pooch for yourself, score some good karma by finding one at K9 Friends. Most dogs need more maintenance than Snoopy, and Paris Hilton and Britney Spears are probably not the best role models for mongrel management. If you want a furry friend but don't like regular walks (several times a week), get a cat. As with any animal, don't get one if you plan to abandon it while heading off on your annual sabbatical in the summer. Most or all public parks in Dubai do not allow pets to enter (either on their own or with their owners). As the UAE is mostly sand and whatever someone has constructed, there are limited areas of nature in which to go frolicking with your mutt. Burj Park in Downtown Dubai is one publicly accessible grassy area which permits dogs (but remember to pick it up when your pooch has pooped). It is relatively small but has a nice view of the Dubai Fountains. Beaches are mostly off limits to dog walking, in theory. You might get away with it very early in the morning, after dark, at an uncrowded beach, or with a small sandy colored dog if you can teach it to slither along on its belly. Walking along public footpaths should be mostly ok. And in a number of districts there are grassy areas outside houses which a semi-public and give your doggie some sort of flora to sniff. A dedicated Dog Park in Dubai opened 03 Oct 2010 in Dubai Investment Park (DIP), run by Paws Pet Planet (or Pet Paws Planet). Area of the park is 14,000 square feet with indoor and outdoor sections. Separate areas for different sized dogs. Off-leash activity areas. Facilities include activity equipment for example balls, bridges, hoops, ropes, toys, tunnels, etc. Also splash pools. Dogs must be assessed by the park staff before entry. Paws Pet Planet owned and managed by Michelle Creasy. Park is open to the public on Friday and Saturday from 0900-1700, entry costs AED 50 for one dog, AED 30 per dog for additional dogs. Cats are not allowed even if they pretend to be dogs and say woof. Park is available on weekdays for customers of Paws Pet Planet day care facility for dogs, open 0700-1900. K9 Friends are the dog equivalent organisation of Feline Friends, operating since 1989. K9, some people may remember, was the mechanical mutt that followed Doctor Who through several universes. Pronounced "canine" ... ... ... ... ... some people need an extra moment for that one. RAK Animal Welfare Center founded in Ras Al Khaimah (RAK) March 2009 by Melissa Davis. Initial development begain in March 2009 with construction starting in June 2009, and opening date expected to be March 2010. Shelter and home for stray cats and dogs. Cattery and kennel service for pets while owners are away. Other services include vet clinic, rescue, rehabilitation, sterilisation, immunisation, and re-housing of stray dogs and cats. Centre Manager is Ellen Quanjer (as of February 2012). Website www.rakawc.com. Facebook page at www.facebook.com/pages/Ras-Al-Khaimah-Animal-Welfare-Centre/105691119481576. Moving from location near the RAK Goat Market to Al Hamra, unknown when, maybe mid to late 2011? Emergency tel: +971-50-4876041. See www.rakawc.com website contact page for other contact numbers. Information updated February 2012 - email supplied. Previous Facebook page at www.facebook.com/pages/RAK-Animal-Welfare-Centre/206150697343 appears to have expired. Previous contact information rakanimalwelfarecentre@hotmail.com, donations4rawc@hotmail.com, mobile telephone +971-50-1951888, assumed to be no longer valid. Abu Dhabi Bloodbank for cats and dogs - established by Dr Katrin Jahn. Dog blood groups interchangeable usually, about 20 identified. Cats must receive blood from the same group, identified as A (mostly Siamese & Burmese), B (about 30% of cats), AB (rare). A bag of blood costs 800 dhs, +100 dhs for the blood transfusion set and filter. Source: Emirates Today 28 September 2007 page 3. Contact Dr Katrin Jahn at the British Veterinary Centre in Abu Dhabi (tel +971-2-6650085) if you have a pet ready to donate blood, or a mangled moggie needing a top-up. Terrapins are cheap to buy, expensive to maintain, cute when small, possibly aggressive when older, require a great deal of attention, and can carry salmonella bacteria. If you don't like your children, give them one as a pet. Otherwise buy a goldfish. 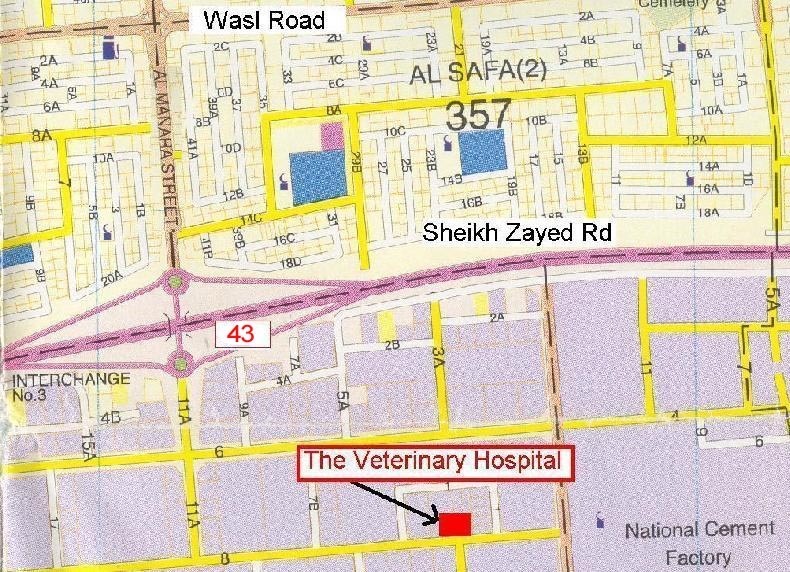 American Veterinary Clinic in Abu Dhabi - tel +971-2-6655044, email avc@emirates.net.ae, location map. Emergency tel +971-50-6151711. Recommended by Feline Friends. British Veterinary Center in Abu Dhabi - 30th st (between 9th and 7th st), Khalidiya, tel +971-2-6650085, email info@britvet.ae, location map. Recommended by Feline Friends. National Veterinary Hospital, Abu Dhabi, tel +971-2-4461628, +971-2-4461828, email info@nationalvet.com. Al Barsha Veterinary Clinic (ABVC), Al Barsha, Dubai, tel +971-4-3408601. Opened October 2004. Recommendations seen. Emergency tel +971-50-7540226. Blue Oasis Petcare Hospital, The Green Community, tel +971-4-8135050 or toll-free 800-PETCARE (24 hours), email office@blueoasispetcare.com, location map. Austrian and German doctors to keep your pets operating efficiently. Vorsprung durch Technik or something. Deira Veterinary Clinic, tel +971-4-2694987. Dr. Matts Veterinary Clinic, tel +971-4-3499549. Often recommended. Dubai Municipality Veterinary Services Section, tel +971-4-2891114. Energetic Panacea Clinic of Alternative Medicine for Animals in Jumeirah - Al Wasl area. They offer holistic treatments and therapies for pets. Say what? Telephone	Hilke Meyer-Reumann +971-50-8438369 or Jessica Heid +971-50-4537693, email info@energetic-panacea.com, location map. What would Gerald Durrell say? European Veterinary Center , tel +971-4-3439591. Jumeirah Veterinary Clinic, off Al Wasl Road, tel +971-4-3942276. Recommendations seen. Jumeirah Veterinary Hospital, tel +971-4-3442498. Modern Veterinary Clinic, tel +971-4-3953131. Noble Veterinary Clinic, in The Green Community, tel +971-4-8854848, email nobleveterinaryclinic@gmail.com. Rashidiya Municipality Clinic, tel +971-4-2863366. Vaccinations only? Safa Veterinary Clinic, near Al Wasl Road Choithrams, tel +971-4-3483799. Recommendations seen. The Veterinary Hospital, established 1977, moved to large new premises October 2006? Includes a falcon hospital. Hours are Sun-Thu 0800-1900, Fri closed, Sat 0800-1300. Tel +971-4-3387726, location map. Emergency tel +971-50-6577851. Deena Veterinary Services, tel +971-6-5567671, email deenavet@emirates.net.ae. Europets Veterinary Hospital, open May 2005, Villa 341 Mirgab street Al Quadsia area, location map, tel +971-50-8606857, email europetshospital@hotmail.com. 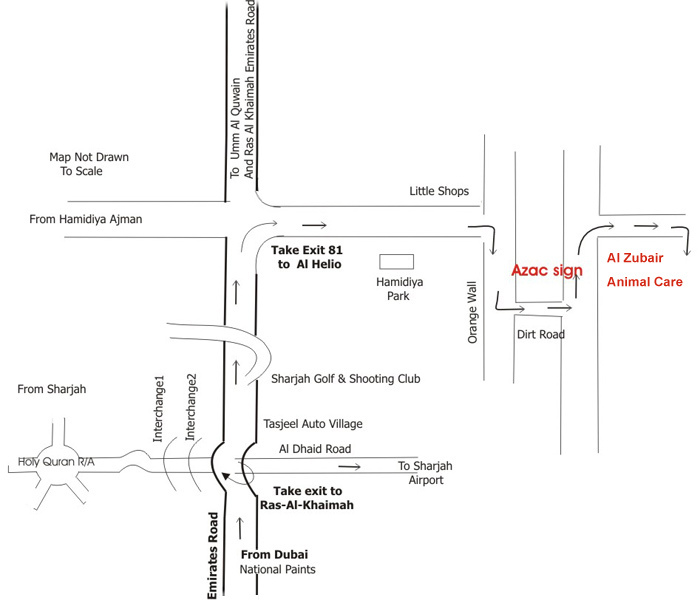 Al Zubair Animal Care, Ajman, location map, tel +971-6-7435988, email info@azacuae.com. Also has animal boarding facilities. Book well in advance (3-4 months at least) to be sure of a place over Christmas, New Year, and the summer months (June, July, August). Al Zubair Animal Care, Ajman tel +971-6-7435988, see under Ajman vets for more contact details. Boarding rates are 35-75 dhs per day for cats and dogs depending on weight and hair length. American Veterinary Clinic in Abu Dhabi has air-conditioned accommodation for dogs in Mussafah, tel +971-2-5511578, and for cats in their facility in Abu Dhabi (see Vet list above for contact details). Animal Care Centre Sharjah kennels and cattery, pick up and delivery service available, see above under Sharjah vets for contact details. Churchwood's Private Cat Hotel - Al Barsha, opened in 2006, tel +971-4-3415201, fax +971-4-341 5201, email churchwoods@dubaiparent.com. Daily boarding rate AED 70 (in 2010). Cloud9 (Cloud 9) - Abu Dhabi - Khalifa City A, open February 2012. A luxury pet hotel (not just an ordinary kennel) for VIP pets. Only in the UAE ... of course. Room rates AED 80-150 per night (during 3 month launch period, will increase after that, normal rates not supplied). Some rooms include a TV. 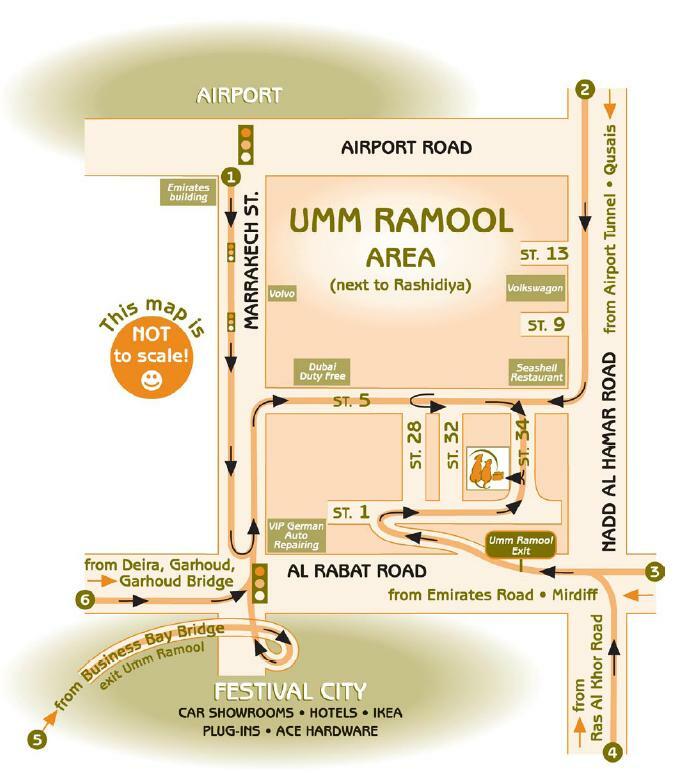 Dubai Kennels and Cattery (DKC), Umm Ramool, Rashidiya, established 1983, airconditioned, tel +971-4-2851646, location map. Boarding rates 35-85 dhs per day (August 2007). Mice, birds, gerbils are food cheap, big long-haired dogs are expensive. Often recommended. Pet Resort UAE - services suspended says their website September 2007. Posh Paws Dubai (The Animal Care House) kennels and cattery - address is in Sharjah though, email poshpawsdubai@yahoo.co.uk, mobile tel +971-50-2730973, PO Box 28318 Sharjah, rates AED 60-80 per night (in 2010), collection and delivery service available. Also called PoshPaws Animal Sanctuary or is a different place? The Doghouse, Dubai (also Dubai Dog House or Al Quoz Animal Care), Street 323, Al Quoz Industrial Area near Spinneys warehouse, established 1997, airconditioned, tel +971-4-3471807, email info@dubaidoghouse.com, location map. Urban Tails - a seven star resort (apparently) for pets. Butler service available (we're not joking). Room rates (in 2012) about AED 100-400, which is cheaper than the Burj Al Arab hotel for humans. Location Dubai Investments Park (DIP), website www.urbantailsdubai.com. A luxury air-conditioned hotel for pets, opening date expected to be March 2014 (WAMi or press release 19 Dec 2013). Location in Al Warsan 3, project cost AED 54 million. Area given as 835 sq meters, with 30 rooms, capacity 50 dogs. Facilities include dressing and grooming rooms, therapy sessions, laundry services, playgrounds, supervisors, veterinary services, online monitoring of pets. 19 Dec 2013 PR - Birds and Pets Market or Souq next to the Pet Hotel complex in Al Warsan (hopefully not where they sell your pets while you go on holiday) opening date delayed until March 2014. Area given as 50 hectares (which sounds enormous). Facilities include 695 sq m administration block, 960 sq m auction area, 418 sq m medical clinic, 359 sq m health quarry (what? ), and labour accommodation for humans with capacity 282 persons in 94 rooms. 05 Jan 2012 - Bird and Pet Souk under construction in Al Warsan district, construction started April 2011, opening date expected by the end of 2012. Area 152,000 sq meters, being developed in two phases. Phase I cost AED 60 million, facilities include 120 shops and auction units, veterinary clinics, offices for management and public services. Phase II facilities include a pet hotel, pets and birds breeding learning academy, worker accommodation. Dogwalk - luxury (and expensive) accessories and services for dogs. Homely Petz - part of Pet's Delight, dog training and behaviour modification, dog walking, online pet store. Tel +971-4-3994223, mobile +971-50-8717072 (emergency calls only after 1900), PO Box 29893, Dubai, UAE, email info@homelypetz.com. Pampered Pets - outrageously expensive pet accessories shop. Website www.pamperedpets.ae. Tail Waggin Mobile Pet Spa - mobile grooming services for pets (nails clipped, hair cut, etc). Available in Abu Dhabi, Dubai, Sharjah. Mobile phone +971-50-3666622, PO Box 75375 Dubai UAE, email info@thetailwaggin.com (or thetailwaggin@gmail.com? ), website www.thetailwaggin.com (not available). Pet shops in the Emirates have a bit of a bad reputation with neglected animals crowded into small cages and an apparent disdain for anything that might remotely approach a semblance of animal care and welfare. The ones in Satwa make an occasional appearance in newspaper letters pages as being particularly bad. Rather than go straight to a pet shop, ask at one of the vets above where they would suggest getting some animal company. Or take the charitable route and go to Feline Friends or K9 Friends. Ed's Pets Jumeirah Beach Road, near Citibank. New in September 2009? Is the same Ed Hardy fashion store and pet shop that was the center of the brouhaha reported by 7 Days newspaper on 24 September 2009? Petzone might be one that makes a change from the stereotype, although you can find complaints about them too. Petzone, tel +971-4-3402902, fax +971-4-3210711, petzone@emirates.net.ae (zu.ac.ae). Petzone LLC, PO Box 72174, Dubai UAE, tel +971-4-3431320, fax +971-4-3435670 (AME info). Pet Zone in Modhesh Fun City at Dubai Airport Expo - a display of different animals for children to enjoy observing, not a pet shop. Homely Petz (Homely Pets) - dog walking, pet care? *Pet Oasis - on ocean side of main road between Al Hamra Village and RAK, near Al Hamra Village (GM)? Opposite Majan Printing? Check location. Different from Pets Oasis in Umm Al Quwain (UAQ) ... or not, same website given? *Pets Oasis - website www.petsoasisuae.com (not www.petsoasis.com which is spam). Same as Pet Oasis in RAK? Royal & SunAlliance no longer offer pet insurance (14 September 2009)? Royal & SunAlliance (or Royal & Sun Alliance), a UK based insurance company with operations in the UAE will insure your cat or dog (other animals are not mentioned in the policy) for medical fees, loss or damage to pet or caused by pet. Tel Abu Dhabi +971-2-6351800, Dubai +971-4-3029800 or +971-4-3344474, Sharjah +971-6-5631819 or get a quote online from their Faster Quote website (but it's probably faster to call them). Dubai Zoo - no, not somewhere to buy or sell your pet. Or donate it (apparently they do get a few). www.dkc.ae - Dubai Kennels and Cattery website. www.dubaidoghouse.com - Dubai Dog House website. www.emiratespets.com - Pet blog in the UAE (on the internet no one knows you're a dog?). Has lists of cats and dogs looking for homes, and a forum where you can ask all your pet questions. www.energetic-panacea.com - Energetic Panacea Clinic website. 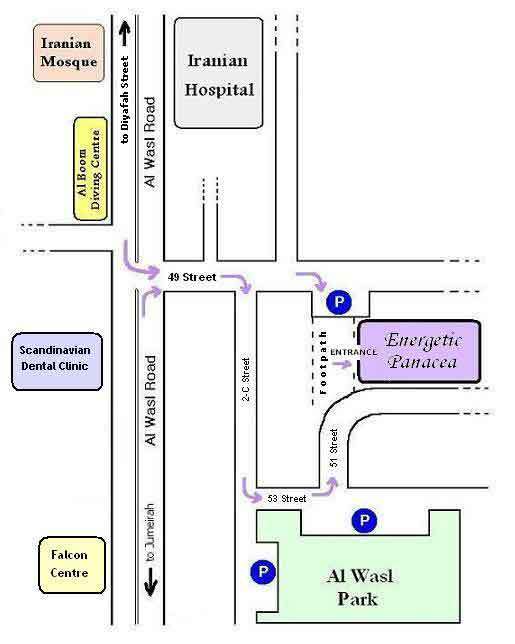 Forwards to www.pets-uae.com, not available Aug 2014.
www.europetshospital.com - Europets Veterinary Hospital location map. www.fasterquote.ae - Pet Insurance information and quote request (no longer available? ), website redirects to www.rsadirect.ae. www.felinefriendsuae.com - Feline Friends in Abu Dhabi website. Not available Aug 2014.
www.felinefriendsdubai.com - Feline Friends in Dubai. www.homelypetz.com - dog maintenance services. www.ipata.com - Independent Pet and Animal Transportation Association International, Inc (zu.ac.ae). www.k9friends.com - K9 Friends website. www.nationalvet.com - National Veterinary Hospital Abu Dhabi website (offline September 2009?). www.petdubai.com - pets in Dubai information website. www.petresortuae.com - Pet Resort UAE website (service suspended September 2007, website is spam when checked September 2009). www.pets-delight.com - chain of pet supplies shops in Dubai. www.pets-vets.com - looks like a UAE pet information website but most of it is stuck behind a login page. www.poshpawsdubai.com - Posh Paws Dubai website. www.uaepetclub.com - forum and classifieds for pets in the UAE but flooded with spam posts when last checked (October 2009). www.vet-hosp.com - Vet Hospital Dubai website. www.dubaifaqs.com/pets-in-dubai.php (PDF and print version).